By now, every basketball fan in Europe is fully familiar with teen sensation Luka Doncic's hugely impressive skill set. During his 47 Turkish Airlines EuroLeague games to date, Real Madrid's 18-year-old guard has already produced an eye-catching array of spectacular highlights: athletic dunks, powerful blocks, flashy drives to the basket and pinpoint assists…Doncic has got the full package, and that led last season to EuroLeague head coaches voting him as the youngest winner ever of the Rising Star Trophy. Considering his tender age, however, perhaps even more impressive than the young Slovenian's physical talent is his intangible but crucial ability to "feel" the game and read the court. Possessing the ball-handling skills to split the defense with a perfectly placed pass to a teammate is one thing, but being able to even see the possibility of that pass in the first place is a completely different matter. And for one so young, Doncic's mental conception of the game is truly exceptional. If you ask the man himself where his court awareness comes from, he will confess that he has little idea and doesn't even really think about it. "When you think too much, you don't play that well. When you don't think, you can enjoy it and play basketball. It's better this way and I think most of my best games have been when I've just enjoyed it." The source of Doncic's gift – his innate understanding of the spaces available on the floor and how he can control them – is partly genetics, for sure: His father Sasa was a successful professional who was respected for his creativity and intelligence, and we can be thankful to the laws of biology for passing on those skills to his son. The fact that Luka was a basketball obsessive practically from birth also helps. According to family folklore, he first had a basketball in his hands at seven months old and from that moment was rarely seen without one. Another central aspect of Doncic's mental development in the sport came when he started playing basketball at seven years old. Judged to be too good to play with his peers, he was pushed up several age groups. "I was playing with guys who were nine or ten, and that was the beginning," he recalls. "I was always training and playing with older kids who had much more experience than me. Many of them were bigger and faster than me too, so I had to beat them with my brain." 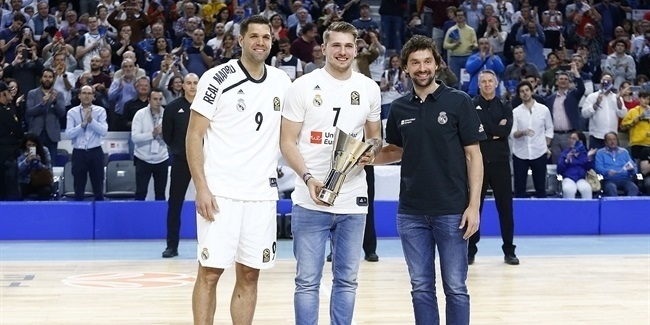 Some key individuals also played a role in helping Doncic develop and improve, and he has particularly fond recollections of his long-time youth team coach Jernej Smolnikar, whose significance extended beyond the basketball court. "He coached me for five years at Olimpija Ljubljana until I went to Real Madrid," Doncic explains. "He was very important for me. I remember one day I got a bad grade at school and he didn't let me train as a punishment! So that's the reason I had good grades afterwards, because I wanted to be allowed to train." Despite being regarded as a child prodigy, Doncic was always humble enough to remain open to outside influences. "When I was 15, my coach at Real Madrid was Paco Redondo and he really helped me a lot," Doncic says. "He left his mark. 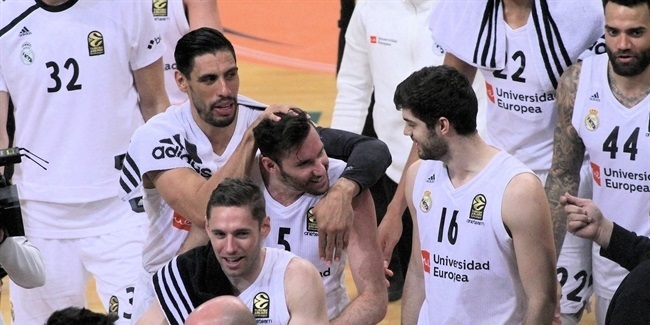 Then I started to train with the first team and play with Sergio Llull and Sergio Rodriguez. They are two of the best players in Europe and I learned so much from those guys. They really helped me so much." Doncic's willingness to learn from others – rather than thinking he already knows everything – is reflected in his calm, sensible approach to his future in the sport and his level-headed outlook on life in general. Having already become a European champion with Slovenia and won two Spanish league titles with Madrid, as well as being showered with glowing personal plaudits by pundits everywhere from Alaska to Australia, it would be easy for Doncic to start getting carried away with the success he has already enjoyed. But even though he is widely regarded as the hottest young prospect in the world, you get a strong sense there is no danger of Doncic becoming complacent or sidetracked. "I could do a lot of wrong stuff," he acknowledges. "When you become a little bit famous, that can happen. But I know that I need to keep my feet on the ground and stay on the journey. Training, training, training, all the time training. And also important things like eating well. "It's great to see people saying nice things about me, but I try not to react too much because I need to be focussed on basketball and focussed on my team. Real Madrid is the best place I can be right now, and I'm very proud and happy to be here." As well as his family, Doncic can rely upon a group of childhood fans to ensure he doesn't stray from the path, as he reveals: "I have a lot of friends from school in Slovenia and my summer camp, I'm in contact with them all the time and sometimes they come to visit me in Madrid. "The most important thing is when we go to dinner, for example, maybe some people would think I need to pay everything because I earn the most money. But it's never like that, we always share and that's very important. "I'm just one more friend. Nobody is different. They joke with me, we play around with each other, and we are all the same. They don't treat me any different from anyone else, and that's how you know they are real friends." 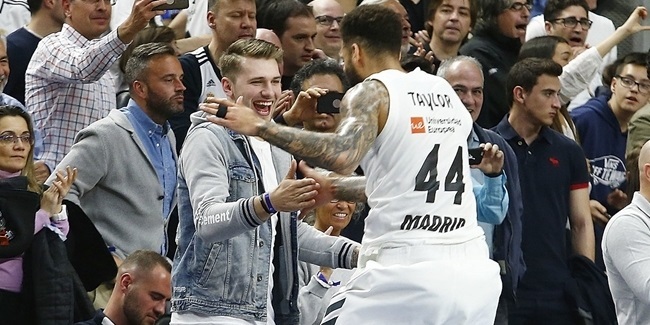 As Doncic becomes older and his star continues to rise, there will inevitably also be an increasing pressure to succeed – before long, scoring 20 points and dishing 12 assists will cease to be an amazing achievement and start to become an expectation. But he insists that he is not worried by that increase in responsibility. "I don't think I will have more pressure," Doncic said. "Everyone asks me if I feel the pressure but I say 'No, it's just a game.' It's just a game of basketball. As I said, I was born to play and I love playing. I love the sport and there's no pressure when you're doing what you love." In conversation with Doncic, that sentiment – that by playing basketball he is doing what he loves – continually recurs. Perhaps that – more than any technical or mental attribute – is the most important explanation for his extraordinary abilities. "I enjoy everything about basketball," he smiles. "Seeing a teammate score, making an assist, making a basket, playing good defense…I don't care, I just want my team to win, which is the best thing of all. "I feel I need to enjoy basketball. When you come to the point you don't enjoy it, something is wrong. But I still really enjoy playing, and that's the key for me."